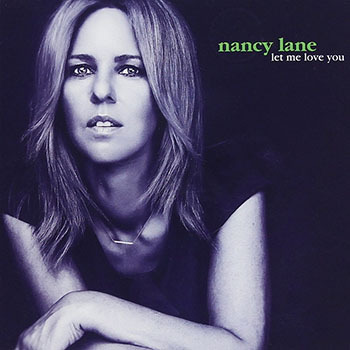 The Canadian singer, Nancy Lane seems to have a voice made for the elegiac song, the ballad and other similar music. But she can swing delightfully as well. You might miss this latter characteristic when you listen to Let Me Love You and when you go over the titles of the music on the disc. It happened to me when I first received her disc and flipped it on its back. So spin the disc before you make up your mind and cast it aside, Nancy Lane gives an alluring, absolutely breathtaking performance on this disc. Lane is a singer who appears diffident about her range. She should not be. Not only does it stretch several octaves, but it has a certain brightness that makes her lines almost silvery. Often she can be heard crushing the downbeat with rhythmic flair and heart-stopping vocalastics as well. If you listen to What is this Thing Called Love or even before that Cry Me a River, you will hear what I mean. There is more. Lane sings with pristine diction and her enunciation might be cause for envy among her peers. This aspect of music cannot really be taught to a singer. She also seems to be born with relative perfect pitch. The manner in which she bends and twists notes and then restores the melody to its immaculate originality is something to behold. Speaking of swing, Nancy Lane is really old school. She could have fronted a big band – one of those like an Ellington or a Basie Orchestra and she would have done the bands proud. If with a small ensemble she is able to push the players into a swinging zone so they absolutely play in the pocket, I can only imagine what will happen if and when Nancy Lane appears with a big band. This record has probably made its appearance in a crowded field. North America and Canada are its intended targets and there are plenty of vocalists out there fighting for a share of voice. Lane is, however, in good hands as far as PR is concerned and her record appears to be getting some airplay. This is a good thing because talented new artists deserve our attention. I have one reservation that only Lane can take care of and that is to sing a more contemporary repertoire. I am dying to hear how she would handle that. Track List: Let Me Love You; I Can’t Believe That You’re in Love with Me; We’re Together; Tout ce que veut lola; Everytime I’m with You; Cry Me a River; Everything I’ve Got Belongs to You; All of You; You Took Advantage of Me; What is this Thing Called Love; Just Say I Love Him. Personnel: Nancy Lane: vocals; Lara Driscoll: piano; Kenny Bibace: guitar; Mike De Masi: bass; Dave Laing: drums; François D’Amours: tenor saxophone (2, 6, 7); Aron Doyle: trumpet, flugelhorn (3, 4, 10).